A couple of years back I visited Amer Fort in Jaipur, India. The construction of Amer fort was started by Raja Man Singh in the year 1592. Its construction was completed by Sawai Jai Singh in 18th century. Amer Fort was completed within two centuries by consistence efforts of three consequent kings following Raja Man Singh. This was the first time I realised that all great things take time to build. Our generation want success to be immediate. Nobody has the time to do the right things and build a strong foundation. We live in the world of instant gratification where we want things to happen right now. Instant gratification is fueled by mobile devices, social media, and information overload. I read somewhere that chemical reaction of social media on our body is similar to alcohol. Social media triggers dopamine high. Dopamine is a critical receptor in the human brain that controls a wide array of functions, particularly ones that relate to how the brain interacts with the body. Dopamine is released when we do things that give us pleasure like listening to music or drinking alcohol. We want to do more of the thing that give us pleasure. This finally leads to addiction causing more harm than good. Now, you will be wondering how all this is linked to the topic of this post — The Compound Effect. 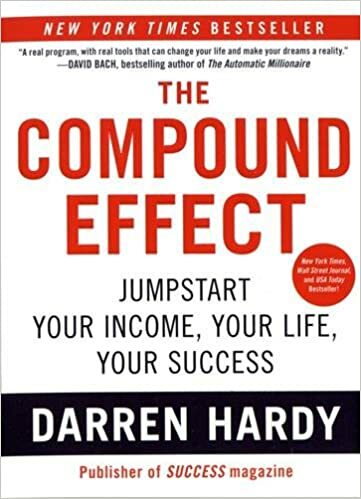 Recently, I finished reading book The Compound Effect By Darren Hardy. Choices are linked to our habits. We make choices that go well with our habits. If you are a habitual smoker, you will end up choosing people who smoke and drink. Spending time with other smokers will make you smoke more and making other poor life choices. Your choice of people determine how you end up spending your time. I am particular about getting away from people who gossip a lot. I usually get a negative vibe from some people and when I feel that I try to limit my interaction with them. The book makes an interesting point that you should know whether you should spend 3 minutes, 3 hours, or 3 days with a person. All people are not equal. There are limited people with whom you can have a connect at intellectual level. Look for those people and spend your time with them. These are the people that bring the best in you and help you achieve higher goals. Your success is linked to your habits. We all should try to build habits that over time can bring meaning and success to our life. The Compound Effect is a good book that you can read to kick start a self-transformation. I enjoyed the book thoroughly and I hope you too find it useful.